ANNE KLEIN NEW YORK MADE IN ITALY Brown & Beige Platform Shoes ♡ Size 7 1/2 . Condition is Pre-owned. Shipped with USPS Priority Mail. Has some wear. Please, view pictures. Smoke free home. Payment within 48 hours! These beautiful Anne Klein flats are pre-owned but New (never worn). The color is a fabulous Metallic Bronze! The wedge heel is about 1-1/2”, the color is solid on the heels and the back of the shoe. While sides of the shoes have a small oval shape hole pattern design. See pictures; This pair definitely screams “I am Ready for Spring!” Yess! It’s a casual shoe but can be dressed up or down. Shoe shipped without box. Thanks for checking out my auction! Hope you bid and win! Please leave feedback if you win one of my auctions. I leave feedback for all. Thanks D Happy Bidding! Man made materials / lace up / closed toe closed back / low heels - about 1". Regional Priority Flat Rate B box a little smaller than a flat rate large box and rates vary. Once one item is bought, we can see the flat rate A & B rates. HEEL HEIGHT: 2.5". Need it fast?. UPPER: Synthetic. Insole from center heel to center tip of toe: 10.5”. Heel: 2.5”. Width at widest part of insole: 3”. Anne Klein iflex AKCase brown leather upper with white stitching. Pointed toe and kitten heels. Anne Klein Akvelie Heels Womens Size 8M Gold Leather Peep Toe Slingback Shoes. Condition is Pre-owned but in like new condition. Zero wear or flaws. These shoes are solid in color but in the light have a "glisten effect" due to light sheen in material. Gold braided toe. Shipped with USPS Priority Mail. AK Anne Klein Vintage Shoes: Black Leather 2 1/4" Heels w/ Gold Chain - Sz 7.5. Condition is Pre-owned. Shipped with USPS Priority Mail Flat Rate Envelope. Ladies Anne Klein Faux Snakeskin High Heel Buckle Shoes 7.5 M. Condition is Pre-owned. Shipped with USPS Priority Mail. Anne Klein black patent leather pumps shoes with front silver buckle detail. Thick 3.5" heel and square toe. Please view pictures carefully they are my best description. Beautiful heels Pump Black Size 7.5 Preowned and in good condition Happy shopping!! Long pointed toe. Light brown and tan snake print leather uppers. Leather soles with 2 1/2" leather wrapped heels. Leather lining, cushioned insoles. Nice little pair of basic black shoes to go with just about anything. Made of a fabric and the strap and buckle accent is of a faux patent leather. EUC See all images for details. Ann Klein Black Womens Classic Pumps Womens 7.5 B Width. Condition Very Good. A stylish look for you ready to be stepped out in. Gorgeous AK strappy open toed sling backs. These were worn one time, to a wedding. In like new condition, with box. ANNE KLEIN BLACK SATIN POINTED TOE ANKLE BUCKLE PUMPS SIZE 7 1/2 Preowned in great condition. Only worn once. Some very light wear on soles and heel caps and light creasing of material on top of shoe (see photos). From a smoke-free and pet-free home. Comes with a box of a similar shoe, not the exact box. Please don't hesitate to ask any questions. Have been only worn gently worn once. Gorgeous and EUC very well cared for. No Longer in production. Multi Fabric pointy heels from Ann Klein. Ankle strap approx 3.5" high see photos for all other details. Item Description Classic round toe mid block heel pump Product Features: Anne klein iflex technology allows for a flexible fit that can bend up to 90 degrees Available in a variety of uppers Patent leather upper with contrast mirror metallic covered block heel Easy slip-on wear 3mm foam cushion and man-made lining and insole Color: Metallic taupe Size: 9 Fast Shipping!!! Trusted Seller!!! Anne Klein sling backs - good preowned condition. View photos. Any defects (stains, tears, etc.) are listed and pictured to the best of our ability. Beautiful 3" heels. Gorgeous details new never worn. Lots of style with buckle details! Heel - 1 5/8", wedge. These are the cutest shoes on and super comfortable! I wore them to a Wedding once for about two hours. Still in excellent shape. You won’t be disappointed in these. Paid $69.99 for them brand new. 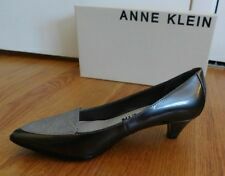 These are nearly new black patent (man-made) 4" wedge, open toe, sling back shoes by ANNE KLEIN. ANNE KLEIN Ankle Strap Heels in Size 7 1/2 M.
This is a stylish pair of ANNE KLEIN Ankle Strap heels in Size 7 1/2 M. These elegant ankle strap heels were Made in China. There is a small rubbed mark on the left inside of the right shoe.not visible when wearing. VERY NICE BLACK STRAPPY SPORT SANDALS BY ANNE KLEIN. SIZE 7 1/2M. Good condition. Light modest wear to uppers, inner and outer soles. Smoke, odor and pet free. These were never worn. The Wine Colored Vegan Patent Leather is not as shiny as regular Patent Leather. Anne Klein. A bit of elastic stretch in the sling to adjust to the shape of your foot. Heels are 4" high. Materials are man-made. Size 7 1/2. With that they may have light scuffs, scratches, or soil from being tried on to being lightly worn. We do our best to describe the condition. Material: Fabric Upper, Man Made Sole. Occasionally we all make mistakes. I am always willing to cordially work out misunderstandings when necessary and try to keep this an enjoyable and fun experience. 100% Leather. Elasticized topline. Padded collar. Faux jewel buckle. Low 2.5" heel. I tried to capture all defects, if it has any. SLIP RESISTANT OUTSOLES. SYNTHETIC UPPERS BALANCE MAN MADE. Very Comfortable and Nice! Classic style has never been easier than with Anne Klein Sport. 3" molded wedge heel. Wear to work or Play! Nice and clean and ready to wear! Flexible sole. AK Sport comfort cushioned insole. Used pair of Anne Klein Silver Maefraimm Snakeskin style pumps heels. Sold as is, lightly worn. Item has been in storage, comes in original box. Please see pics for more detail.